Here’s a common problem many runners encounter: if two people want to run together, but their speed is significantly different, is there any way for them to be compatible? The short answer is, yes – if it’s done properly. But there are some guidelines that must be adhered to. Believe it or not, this topic has been thoroughly examined by one of our very own Monterey County running experts. 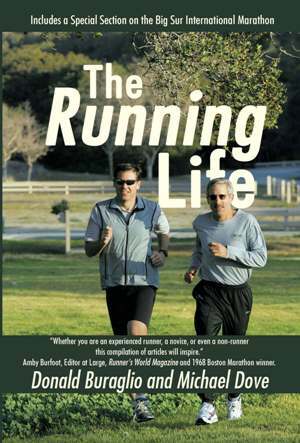 Dr. Jay Cook is a local running guru. He is a West Point graduate and a respected chiropractor, and was a blazing fast marathon runner in his prime. He runs and races for enjoyment now, and most people know him as a wise mentor in the ways of running and life. Healthy runners seek Jay’s advice on how to maintain a healthy lifestyle. Injured runners go to Jay’s office for treatment, and usually get back on the road as good as new. Many years ago, Jay identified the problem of “pace compatibility” amongst runners. The solution to this problem is known as the “circleback”, where the faster runner will run ahead for a period of time, then retrace his or her steps to rejoin the other person a short while later. 1. The faster runner always gives advance notice. "Stay comfortable, I'll circle back" is a good phrase to use before surging ahead. Sometimes, the circleback location can be agreed upon, but this is not an imperative. 2. The faster person breaks clean and runs ahead until feeling “worked out,“ then doubles back toward the slower person, or runs out and back on a side trail/road until meeting up with the slower person again. 3. The faster runner returns to the main trail/road behind the slower runner and gradually matches the pace to allow resumption of conversation. 4. When rejoining the slower person, the faster runner should never, NEVER make witty comments about the slower runner's pace. Trust us - your best-intentioned remark is sure to be interpreted as a put-down. Don’t even make eye contact with the slower person, which may be interpreted as demeaning. Don’t give the slower person advice. Don’t give him a phony complement. This is the most delicate part of the entire process, so be very cautious. If in doubt, just shut up and keep running. The slower person will talk when he’s ready. The circleback process can be repeated as many times as desired during the course of a run. But as a general rule, the fewer times it happens, the lower the risk of interpersonal tension. There’s another variation to this theory, which is kind of an inverse circleback. Occasionally, a faster runner will allow the slower runner to run ahead, while they hang back for some equipment adjustment (such as tying shoelaces or taking off a jacket), or, um … other types of “equipment adjustment” (such as a bathroom break). Sometimes the stop is legitimate, other times not. If you’re the slower runner, don’t question it – just keep running, and be thankful for the company when the faster runner returns. The circleback theory is versatile enough to be proper etiquette for larger groups of runners as well. The main idea is that with a little flexibility, everyone can enjoy each other’s company, and each runner can still have a satisfying workout. If it helps you maintain a friendship or avoid an argument with your spouse, so much the better. If that’s the case, the next time you bump into Dr Cook, be sure to thank him.